These curved bands are flawlessly contoured to encircle your engagement ring’s center stone, creating the perfect marriage of form and function. A symbol of your undying live the bands are embellished with sparkling diamond accents. Surprise her with a gift so thoughtful and romantic, it will bring her joy to wear each day. Pav & Broome Fine Jewelry offers contoured wedding and anniversary bands in a wide selection of metals, diamonds and gemstones, with or without engravings and stunning borders. Visit our showroom in downtown Gulfport to view our full selection of bands for him or her. One of the most popular wedding band shapes, sure to fit the new bride looking for a unique and unconventional twist to the traditional wedding band. 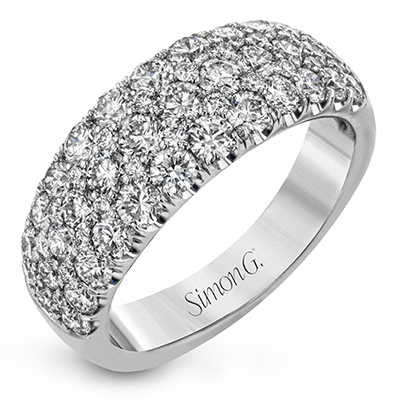 Pavé set diamonds curve halfway round the gold band. Worn delicately underneath your engagement ring or on top for dramatic effect, this curved ladies band truly bends the rule in wedding style.